When on any map with a Withdraw button (free maps and revisited maps), there's a chance that the map will automatically end (in victory) if you go to certain screens like the dictionary and then come back to the battle. It's unclear why and exists in the original too. Whine to Eushully. The Ethereal skill (move through all terrain types, original name is literally "Four Elemental Tolerance") actually just gives every movement skill, so Depth Charge is activated when used against it. It doesn't make a ton of sense. Neither does Depth Charge activating against units on land for that matter. Along those lines, don't try to understand the terrain types in terms of actual physics. They make literally no sense. Nor do magical doors that you can't pass through but can fire arrows/magic through. There's a glitch in the added 2.0 sidequests based around investing cash. After investing, you have to enter/leave dungeons 5 times AND have the same amount of money again. For the first one, you have to invest 100k. After investing that, go do dungeon crap. Then you must have at least 100k again (but don't need to spend it) for it to actually call the event to conclude the quest. Basically, it has the two triggers reversed. It looks at your cash for the second event (after payment) instead of the first. This affects Tian's investment quests only, not Wil's. I went ahead and noted this in the Quest entries. I'm aware that it makes no sense and if I could think of any way to just rewrite the quests so that it did, I would, but... c'est la vie. Also, not really a glitch, but do note that it doesn't actually check if you have enough money for these quests, meaning that you can put yourself into debt from them. You get one "get out of debt free" per hame, but the second one is a game over. You can game this system by using up your cash (at the church or by reinforcing clothes), go into debt and have it all wiped away, then go fill your shop with crap to sell. Spoilers just for screenshot size, not for plot crap. You see this stat? It means NOTHING. Same with this. No skill in the game uses it. For some reason, the range indicator means something slightly different for regular ranged attacks and AoE attacks. For regular ranged attacks, a range of n means anything from 1-n can be targeted. 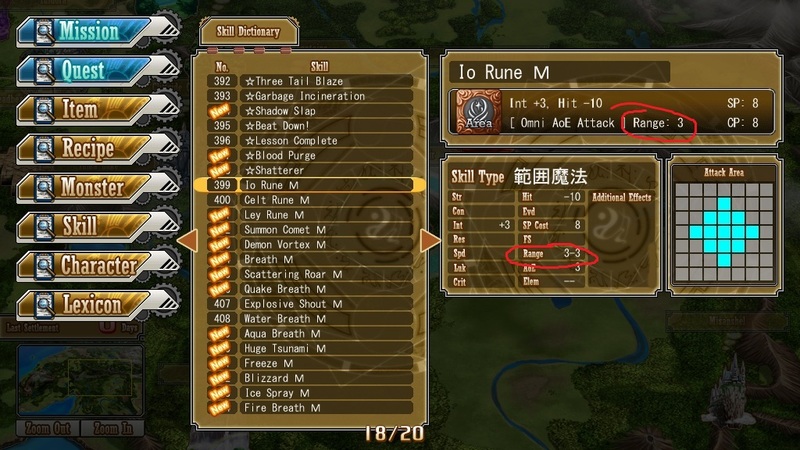 For AoE attacks, it means that only things at that EXACT RANGE can be targeted. IE, a range of n means that the targeted spot must be exactly n squares away. Because of this, both AoE attacks of range 0 (affect all squares around unit) and attacks of range 1 (attack begins adjacent to unit and spread outward or in a line) have an unmarked range in the descriptions. Just so we're clear, it's a Eushully error that the thumbnail for one of Phinny's CGs shows a CG that isn't actually in the game. Have I mentioned enough times yet how this game seems held together with spit and tape in places? I went ahead and just replaced the thumbnail. If you're curious, the original thumbnail had her eyes open. Her giant, freaky, bug eyes. Some furniture has shared event triggers, ie, a single event happens when you put down either one of them. If you put them both down at the same time, the event will trigger for each of them in succession, generating the same event twice in a row. This is easiest to do once Eushully is recruited by putting down a Broom and a Magic Broom at the same time. It's just a silly bug. The skill quick-display in dungeons is gimped for some reason and doesn't show all the skills that monsters have. I really couldn't say why it does this. It seems to be only passive skills that won't get shown, but not much rhyme or reason as to what is and what isn't displayed. Anyway, it's in the Japanese version too, it's not a bug introduced by the patch. The actual full skillsets can be seen in the dictionaries. The way they chose to display the Death status effect is as an extra attack that inflicts -999 HP. What it actually does is generate the attack as above, but then immediately call the victory routine. So basically, it acts just like you'd expect it would, but not how the display indicates. This does mean, however, if you have the Mercy skill equipped (enemies cannot drop below 1 HP), then the Death status will leave the enemy at 1 HP and then the battle will just end as if the enemy was at 0 HP, meaning that you can kill enemies while you have a skill equipped to prevent enemies from dying. I guess this counts as a bug. When reviving a character, they're set to the default "Deployable" state, even if they've already moved that turn. Therefore, in theory, a unit can attack as many times in a turn as you have revive items as long as they're killed each time, whether in battle or friendly fire from AoEs or whatever. Somewhat tangentially, removing a unit from battle gives them the "Withdrawn" state, so even units with Double Action can't move again after being withdrawn, nor can units you remove using an item. Amusingly, the calculation for triggering the Undress status effect that some female monsters have and the calculation for changing their graphic to show them undressed appear to NOT be the same, or maybe just not checked for updates to stats during consecutive attacks (like Flurry). IE, they can lose their clothing but not get the bonus that's supposed to be associated with it. It seems to just be a rounding error though as it happens most often with the high HP succubus variants in Mylen's temple. Assumably, this can potentially happen for the bonus costumes that have Undress as well. I guess this should be noted somewhere since it's a little unintuitive. For whatever reason, leveling up items is done strictly by #kills while the item is equipped. This is ALL kills, so you can use the Yuma Lake fish map to juice item levels very quickly with AoE kills. 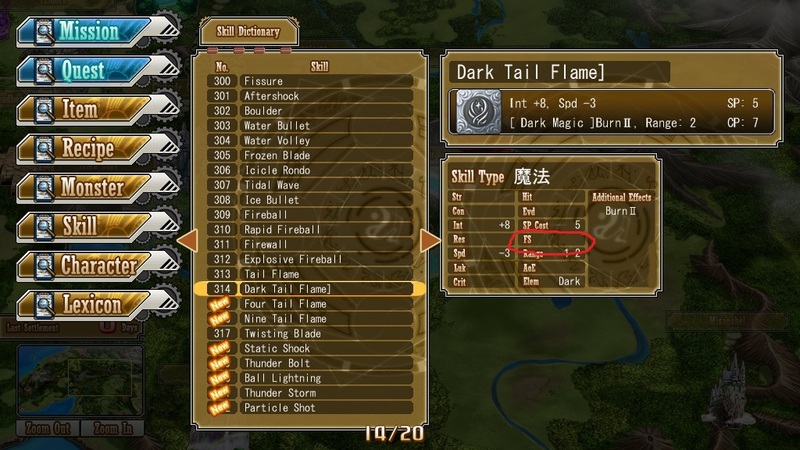 A character's weapon skill level, however, increases just based on how many times a character is in any form of combat as long as they attack (any skill counts too). It also has absolutely no effect except to limit equipping the best weapons. 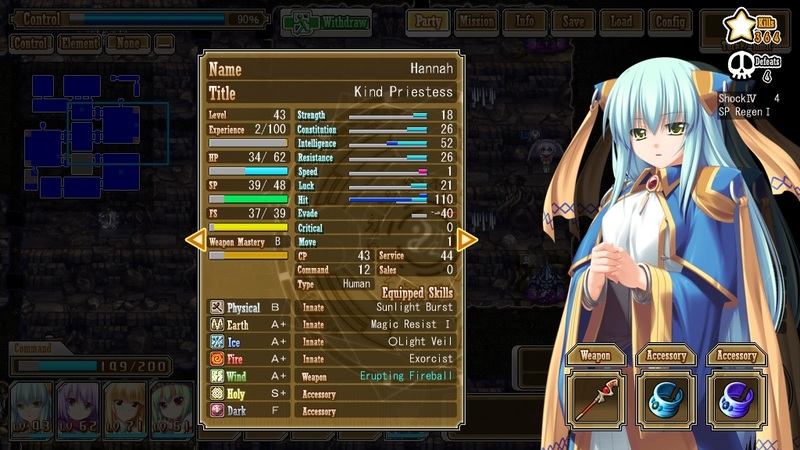 Weapon skill level also grows at a different pace depending on the character, but the main determinant is what portion of the game they're recruited in and what it starts out at. Some maps of plottish-type areas that are closed off by a trigger, whether it's an event square or X turns passing. Any monsters in those areas DO count as being on the map though, so if you beat those maps without triggering the event that reveals the monsters (Cliffside Church's first dungeon on NG+ comes to mind), you won't get the clear bonuses for killing all the monsters even though there are no monsters on the map. Another semi-weird thing is that monsters will not drop character-specific accessories will not drop until that character is actually recruited. Clone units through NG+ do not count. Another bizarre bug. When any of the 2.0 Tian quests begin, it automatically loads his default sprite. If you've given him a wig, it won't load the wig sprite until his sprite changes, making it magically appears on him. Once again, sterling work, Eushully. Lower a stat far enough (like say... evade from the Shock status), and watch the gauge glitch up trying to figure out negative numbers. Certain video codecs can cause crashing at the intro video and also during certain parts in-game, for example when trying to pick up a feather. In my case it was the LAV Filters that were responsible, and I had to uninstall them completely before it would work properly. The LAV Filters included with CCCP don't seem to give it any problems though, only when they've been installed separately. Not sure if this has anything to do with your patch or not, but still worth noting for anyone with the same problem. The game uses small movies in place of common animations, mostly for combat stuff, but for some triggerable things on maps too. I didn't touch any of those files though, so I'm sure it's inherent to the game. It's not the LAV Filters per se but its Splitter what causes issues, that's why people who installed them with CCCP don't have any problem. There might be a fancy way to set exceptions for the LAV Splitter but I just went and disabled all the input formats because I have no idea which one the animations in the game use. The videos are mpeg1 in the mpeg-ps container. The Arena's % of completion is sort of bugged. It's checking against all possible battles through the arena menu. However, three of them are exclusive to Emi's route. Therefore, on Yuela's and Serawi's routes, you can never get 100% completion in the Arena. There are also a couple solo Wil battles added with 2.0 that have other sidequests as prerequisites that are failable/missable, thus potentially locking you out of that set. 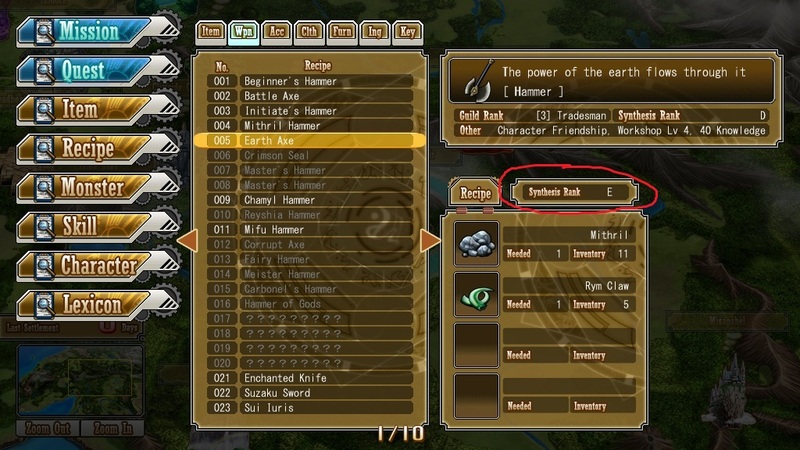 In Chapter 3, when you're supposed to go to the Runic Forest Ruins - Scorched Battleground to fight the Reaper, it says that "All Units Required", and because I had Clone Hannah and Eushully as Clerks, I was getting an error message that a required character was unavailable. On the 'Beshtora Seal' dungeon and 'Room of Legensaad' dungeons—both of which have event tiles that unlock certain areas on first run—when you run them for the second time, the event tiles reappear, as if it were your first run through the dungeon. On 'Beshtora Seal', this fact does not hinder passage to the central area (the rocks are all crumbled and there is access to the central area of the dungeon), and if you trigger an either one of the two event tiles on your second run, the game will think as if you triggered all the event tiles and displays the message/Wil's dialogue that indicates that the central area has been unlocked (does nothing). On 'Room of Legensaad', however, the deal is the same except that the central area is actually locked by an impassible door on your second run (as if it was your first run through the dungeon). After triggering any one event tile on any of the altars, the game will think you triggered every altar and the one you just triggered was the last one, thus unlocking the door to the central area. Triggering any more event tiles subsequently will just display the same message again. Not entirely sure if these predicaments reoccur on third and further subsequent runs. From now on, anything posted in here where the problem comes from in between the keyboard and the chair is going to be deleted as soon as I see it.